Foodeepidea is a free recipe app for Windows 8 and 8.1 devices. When you run the app on your device, you will be presented with the main interface of the app, which is basically a categorically sorted view of the various recipe categories available in the app. The app is pretty lightweight and the best part about the app is that instead of fetching the recipes from online sources, it basically stores all those recipes and hence you can choose to read those recipes even when you are not connected to the internet. The app has a nice soft background music playing all the time, and this makes for a really good and kind of unexpected touch to the app. Foodeepidea is available for free from the Windows 8 App Store. When you run Foodeepidea on your device, you will be shown the main interface of the app as can be seen in the screenshot below. 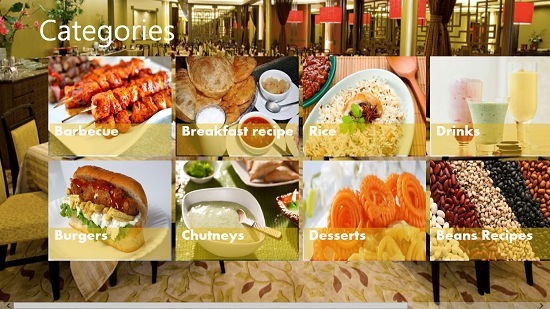 In the above screen you can see that the recipes present in the app are categorically sorted. 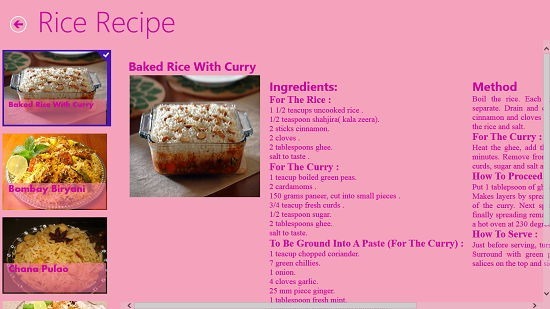 When you click on the tile of any particular category in general, you’ll be able to see all the recipes present in that particular category towards the left side of the screen, and once you click on any particular recipe from the left side of the screen, you will be shown the method of preparation of the recipe on the right side of your screen. This is illustrated in the screenshot below. The pane on the left side of the screen is a vertically scrollable list which you can browse through quickly and when you come across a recipe that you like, you can click on it to open up its instructions on the right side of the screen. You can return to the main screen of the app at any time via the back button located at the top left of the screen. This concludes the main features of Foodeepidea for Windows 8 and 8.1. Foodeepidea makes for a good download on your device if you are an avid fan of cooking and want to learn new recipes at the convenience of your home. You can grab the app by heading over to he link below.